Adding a bit of hot sauce to a meal is a quick and easy way to give it some spice and flavor. For some people, however, hot sauce can cause stomach problems -- often in the form of a burning pain. This is often due to a component found in the peppers commonly used in hot sauce known as capsaicin, which can irritate the lining of the stomach and cause pain in people with sensitive stomachs. Hot sauce can also irritate a digestive disorder, such as a peptic ulcer. Mild pain that passes quickly is typically not a cause for concern, but if you have severe pain or other symptoms, such as vomiting, avoid hot sauce until you can talk to a qualified health practitioner. Capsaicin -- also referred to as Capsicum -- is the active constituent found in all hot peppers including cayenne pepper, jalapeño pepper and paprika. It is what gives peppers the sensation of being "hot," which is why peppers containing capsaicin are found in most, if not all, hot sauces. Taking capsaicin orally in any form can irritate the lining of the stomach, which can result in stomach pain and diarrhea in some people, particularly if taken in large quantities. The capsaicin in hot peppers does not actually damage the stomach, but it does simulate the effect of damage. This occurs when the capsaicin comes into contact with stomach tissue, which releases a chemical known as substance P. Substance P is normally only released when tissues are damaged, so eating hot peppers, even when in hot sauce, essentially tricks the nervous system into thinking there is damage, which then results in the sensation of burning pain. People who eat a lot of hot sauce containing hot peppers can eventually build up a tolerance and not experience any pain, as substance P becomes depleted in the stomach, or anywhere in or on the body, after repeated exposure to capsaicin. Hot sauce, as well as other spicy foods, does not cause digestive disorders but can irritate them, which can result in a variety of stomach problems including burning pain, nausea or simple indigestion. For example, the symptoms of a gastric ulcer -- an open sore in the stomach caused by bacteria -- can be exacerbated by any type of spicy food. If you have gastroesophageal reflux disease, commonly referred to as GERD or heartburn, eating hot sauce may cause pain in the stomach and esophagus -- the tube from the stomach to the mouth. Avoiding hot sauce is the best way to avoid any stomach problems caused by consuming it. If, however, you want to continue to enjoy the flavor it adds to meals, consuming small amounts over time may help build up a resistance so you no longer experience stomach pain. 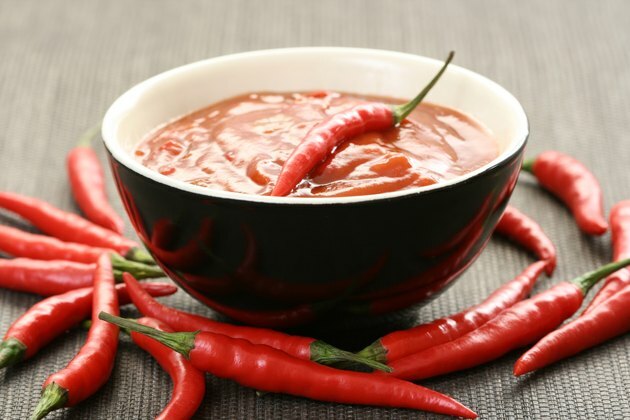 Drinking a glass of milk after eating hot sauce can help neutralize any capsaicin present, which may also reduce pain. Taking antacids can help neutralize stomach acid and might help ease stomach problems, particularly if the problems are caused by GERD or an ulcer. If you consistently experience severe pain or other symptoms after ingesting hot sauce, avoid it until you can see a doctor to rule out an underlying digestive disorder.